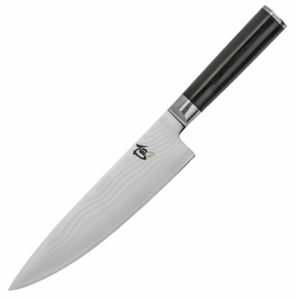 The Kai Shun Damascus DM-0706 Classic Chefs Knife is a premium chef’s knife designed for versatility and efficiency. Although it’s pricey, this is a knife that any chef would be proud to own: it’s used by professional chefs and home cooks alike because of its very sharp blade, attractive design, and comfortable hand. The blade, made with VG-10 Japanese steel, is known for its exceptional sharpness and hardness. This type of steel is also resistant (not immune) to rust and corrosion. The 32 layers of folded steel further add to the sharpness and longevity of the blade’s edge. The Damascus-style pattern also creates an aesthetic watermark on the blade. The edge is sharpened to around 16 degrees, meaning this blade is very sharp out of the box. To compare, traditional European blades are generally sharpened to between 20-24 degrees. The handle is slightly rounded for comfort, and constructed with Pakkawood. Pakkawood is a composite material which is NSF certified for use in commercial kitchens. The D-shape handle comes in configurations for right and left-handed chefs. The handle is balanced and comfortable, which is typical of Kai Shun’s best chef knives. Alton Brown, the host of Food Network’s TV shows Good Eats, Feasting on Asphalt, Feasting on Waves, Iron Chef America and Cutthroat Kitchen thinks that 16 degrees is a big deal, which is why he would always choose a Kai Shun given half a chance! High-carbon premium Japanese steel creates a sharp and durable blade. The Damascus further strengthens the blade and increasing flexibility. The Damascus process also creates microscopic air bubbles on the blade itself, helping to reduce friction during slicing and preventing food from sticking to the knife. Furthermore, this process helps prevent rust and corrosion. The Pakkawood handle has a clean aesthetic and is comfortable in the hand. But beyond those benefits, it’s made of an antimicrobial material that is certified for use in commercial kitchens. Each part of this chefs knife was designed to be not only attractive but practical. The blade itself has an attractive watermark effect resulting from the folded Damascus. No two blades are alike, and the unique pattern is a reflection of the craftsmanship than Kai Shun imbues into each and every chef knife. The depth of the blade, combined with the slightly smaller than average handle can cause issues for chefs with bigger hands. A minor adjustment period would be necessary to fully get the hang of using this chefs knife. Sharpening the blade will be a challenge for beginner chefs. The blade is sharper than your average Western style blade, and using an electric sharpener isn’t recommended. A hand tool designed for sharpening Japanese blades is necessary and will require practice to maintain the sharpness this blade is capable of. The Kai Shun Damascus DM-0706 Classic Chefs Knife earns its reputation as one of the best chef knives by blending commercial certified materials and traditional Japanese craftsmanship. This knife is as aesthetic as it is violently sharp, and is certainly worthy of representing the Kai Shun name. Kai Shun Damascus DM-0706 Classic Chefs Knife – All things considered this knife is a good buy. It’s one of the more expensive knives in our guide, but high-quality steel, a very sharp edge, and a comfortable handle make this one of the best chef knives the price.